I certainly hope you will join me this year in showing support for Illinois State’s efforts in the State Employees Combined Appeal, known as SECA. Throughout my years in higher education, SECA has offered a simple way for my wife Marlene and me to give to some of our favorite charities. From local organizations that make a difference in our own backyard, to international charities trying each day to change the world, SECA provides us all an easy way to donate to the charities we love. I know our Redbird family is constantly in demand, but I hope you’ll find a few moments to fill out the SECA form, and send it to our SECA Chair Georgia Martin at Campus Box 3390. 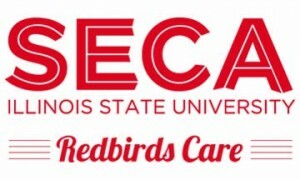 You can find the forms on the SECA website at http://SECA.IllinoisState.edu/. We’ve extended the deadline this year to November 7 to give you more time to show your support.